This article is about Lucario's appearance in Super Smash Bros. 4. For the character in other contexts, see Lucario. Lucario (ルカリオ, Lucario) is a playable character in Super Smash Bros. 4. Its return to the series was announced on January 31st, 2014, six years to the day of the year that Super Smash Bros. Brawl was released in Japan. According to an extra post for its Miiverse reveal, this timing was done to commend the Brawl developers for succeeding in adding Lucario to Brawl. Lucario is now voiced by Sean Schemmel in the English version, who voiced Sir Aaron's Lucario in Lucario and the Mystery of Mew and replaces Bill Rogers from Brawl. As in Brawl, Lucario is also voiced by different voice actors for SSB4's Spanish, French, German and Italian versions. However, Daisuke Namikawa reprises the role for the Japanese version. Lucario is currently ranked 17th out of 55 on the tier list, placing it in the B tier. This is roughly similar to its mid-tier placement in Brawl, where it was ranked 11th out of 38, although SSB4's tier structuring renders it as a high-tier character. Lucario's signature Aura has been strengthened, which is further supplemented by the new rage mechanic. This makes most of its attacks among the strongest in the game when it is highly damaged, with its smash attacks, up and back throws, and its up and back aerials each being easily capable of KOing. The new Aura mechanics also grant new benefits to Lucario's special moves: with high Aura, Aura Sphere grows even larger than Lucario itself, Force Palm's blast possesses significantly more range, Extreme Speed covers much farther distance, and Double Team becomes one of the strongest counterattacks in the game. As a result, Lucario boasts very potent comeback potential, with a single opening being enough for it to KO careless opponents. However, Lucario still maintains its below-average mobility, making it difficult for it to force an approach. Lucario's new Aura mechanics also cause its moves to deal drastically lower knockback and damage at low percentages, making it almost impossible to KO opponents until 150%. While this allows Lucario to combo reliably at low percentages, this makes it much harder for it to combo or create set-ups when it is highly damaged, due to the aforementioned strength of its attacks at high Aura and rage. As Lucario is also dependent on Aura to secure KOs, it has a riskier playstyle compared to many other characters. Some examples are its smash attacks, which have high lag, and Force Palm's grab, which can be escaped at low Aura. Finally, Extreme Speed now gains so much speed at max Aura that it can inadvertently cause a self-destruct if used recklessly, and the move has a full second of landing lag if it ends in the air, making Lucario heavily open for punishment. Lucario has attained decent results in the competitive scene, though its representation is considered below-average. Despite having a number of upsets, such as at Frostbite 2017, where Japanese Lucario player Tsu- placed 2nd while defeating many top players like ZeRo, VoiD, Kameme and Salem, Lucario's true viability has been contested. While Serge and Day continue to develop its metagame, a number of players feel that Lucario's inherent playstyle makes it too risky to be a truly viable pick in the current metagame. Lucario is a middleweight with slightly below-average walking speed, average dashing speed, and above-average falling speed and air speed. It also has average gravity and air acceleration, and the highest traction. These attributes render Lucario's overall mobility as average. It is also able to crawl, wall jump, and one of the only five characters in the game that can wall cling. Lucario possesses a unique mechanic called Aura. Aesthetically, Aura appears as blue, concentrated energy and affects Lucario's entire moveset. Mechanically, Aura is a damage multiplier with a baseline of 0.66× at 0%, and an apex of 1.7× when Lucario has received at least 190%. The multipliers also get multiplied whenever Lucario has a stock lead or not, effectively increasing or decreasing Lucario's Aura. When Lucario is 2 stocks or more ahead, Aura is affected by a 0.6333× multiplier, when at 1 stock ahead it is affected by 0.8×, when at 1 stock behind it is affected by 1.3333×, and when at 2 stocks or more behind it is affected by 2×. This means that, even though most of Lucario's moves have high knockback scaling, their power is extremely low with low Aura; this grants it respectable combo potential, yet makes even its strongest attacks unable to KO until very high percentages. Conversely, high Aura does the opposite: it results in Lucario's combo potential becoming virtually nonexistent, but grants its moves incredible power, with many of them easily surpassing every other character's at maximum Aura. In addition, the rage mechanic further boosts the knockback of Lucario's attacks, which complements their already high power. Aside from that, another big strength of Lucario is the good versatility throughout its moveset. Its aerial game has good uses: neutral and forward aerials are good combo moves, either for starting or continuing them. Down aerial is Lucario's fastest one, and has the interesting property of canceling Lucario's momentum, which can lead to mindgames or gimps. Up and back aerials are Lucario's strongest ones, and since they have immense power when Lucario is at high levels of Aura, they serve as very effective KO moves. Meanwhile, its grounded game also provides decent options, with its neutral attack, forward and down tilts serving as good anti-pressure options, up tilt serving as a decent combo starter, dash attack being a great option to punish laggy moves and Lucario's smash attacks having immense strength overall. Next, its grab game boasts impressive benefits. Since Lucario's pummel is the fastest in the game, it can deal large amounts of damage at high percentages. Its up throw has decent knockback, and can combo effectively at most percentages. It is also the most damaging and one of the strongest when Lucario's Aura is high, making up for its increased power. Down throw can serve as a combo starer as well, but only on light opponents and at low Aura. Its forward throw is the fastest throw in the game, as well as the strongest of its kind with high Aura, along with Bowser's. Finally, its back throw is a very powerful semi-spike, making it excellent for edgeguarding, tech-chasing and, with sufficiently high Aura, KOing. Lastly, Lucario has a very useful special moveset. Aura Sphere is a strong projectile very similar to Charge Shot, but since its size and power are affected by Aura, it is much more dangerous at high percents. Additionally, its high damage output when fully charged allows it to out-prioritize most moves in the game. The charging hitbox is also infamous for being a true combo into Lucario's up smash, which is particularly dangerous at high percentages. Force Palm shoots a blast of Aura forward, with its range and power increasing with aura. If used at point-blank range, the move is treated as a grab, bypassing shields, and has immense power with enough Aura. Extreme Speed is Lucario's recovery move, and is able to cover extremely long distances if Lucario has taken much damage, making it virtually impossible to gimp. It can also launch opponents that get hit head-on. Finally, Double Team is Lucario's counterattack. It is the strongest counter in the game with sufficiently high Aura while possessing impressive range, but it is also the slowest, since any opponent that is not in hitlag will most likely avoid it. Nevertheless, Lucario is not without flaws. Despite its reasonable endurance, Lucario's average weight and low air movement makes it vulnerable to most combos. Extreme Speed, while being a potent recovery move, also has downsides- unless Lucario grabs the edge or lands before it concludes, its very high landing lag will render it completely vulnerable, forcing it to mix up its landing spot. With low Aura, the move is sluggish and does not grant much distance; with high Aura, it is possible to overshoot the stage and self-destruct Lucario is not careful. As an attack it is difficult to hit with, since Lucario can only damage the opponent head-on, without having very high power to compensate. Its combo game is also heavily reliant on throws, as most other combo moves have either very limited follow-up options or awkwardly positioned hitboxes. Its most serious flaw, however, is the polarized strength throughout its moveset when utilized in tandem with the fluctuating Aura mechanic itself. Its fastest moves are the weakest, and its strongest moves are the slowest, making the latter very punishable if not spaced well. Lucario's Aura can sometimes work against it, as attacks with high knockback scaling are bound to finish Lucario off before it has a chance to make use of its rage and/or Aura at the same time. With low Aura, its powerful moves are too weak to KO, and with high Aura, its combo-oriented moves are too strong to be chained together reliably. This makes it imperative to keep in mind how Lucario's attacks and knockback will function depending on how much damage all active fighters have accumulated, as it cannot afford to make mistakes at high percentages. It also often restricts Lucario to using a bait and punish playstyle, as it cannot safely perform rushdowns without getting punished most of the time. This gives Lucario an unusual disadvantage against high-knockback and heavyweight characters; a well-placed and powerful move will often be all it takes to end Lucario at mid or even low percentages, preventing it from utilizing Aura effectively. Lucario's custom moves offer unique benefits and changes in playstyle. Snaring Aura Sphere has a wind effect that pulls opponents in and moves slower, essentially re-purposing the move from a spacing and camping tool to a stage control and edge-guarding tool. Piercing Aura Sphere moves much faster, hits at a lower angle and goes straight through opponents, making it even better at spacing and camping, though at the cost of its immense power. Long-Distance Force Palm has less power, but as its name implies, it has more range, allowing Lucario to strike distant opponents more easily. The grab is also stronger and a semi-spike, making it lethal in any situation. Ride the Wind gives the full distance at any percentage as well as greatly improved maneuverability, at the negligible cost of removing the hitbox from the move. Lastly, Glancing Counter is considerably weaker, but always allows Lucario to attack even if it is not hit. In the end, Lucario is a very technical character whose weaknesses are outweighed by its strengths. While aura makes Lucario's moveset stronger and it boasts great utility at all kinds of percentages overall, it cannot use all of its moves as effectively at certain percentages as others, meaning Lucario cannot afford to get too predictable when approaching as it can take high damage if not approaching correctly, and it might not be able to KO the opponent or even approach it if they know what Lucario will do. This makes playing with Lucario very methodical, as a small error could cost Lucario for it, even if it manages to regain the advantage in any way. Even so, Lucario does have a small but dedicated playerbase, with players like Day, Gomamugitya, Motsunabe and Serge achieving strong results. Lucario has received a mix of buffs and nerfs in the transition from Brawl to SSB4. The modifications to Aura both help and hinder Lucario, and make it much more of a "high-risk, high-reward" character. A number of its attacks have improved combo potentials with minimum to low Aura, but at the cost of their KO potential. Conversely, Lucario's strongest attacks KO reliably even with average Aura, but its combo potential largely wanes as a trade-off. Like Aura, Lucario itself has been buffed and nerfed both directly and indirectly. Thanks to the changes to hitstun canceling, up and down throws are reliable combo starters with minimum to low Aura. By extension, up and down tilts have decent combo potential with minimum to low Aura. However, all of them barring up throw deal less damage. Extreme Speed is safer against edgeguarding thanks to receiving a hitbox, and its distance scales with Aura. However, it is still susceptible to punishment, either by overshooting it while at high to maximum Aura, or by failing to mitigate its noticeably higher ending lag via landing on solid ground. Lastly, Lucario's smash attacks have slightly longer ranges, but are noticeably laggier. Lucario also received a number of useful buffs. Its KO potential has improved, both directly and indirectly: up and back aerials are more reliable KOing options, thanks to higher damage outputs and base knockback, while the rage mechanic supplements them and its other KOing options. Outside of this, Lucario's entire moveset is now affected by Aura; its mobility has been largely improved; and Double Team is stronger. However, Lucario is still burdened in certain ways. Its grounded mobility is slightly below-average at best in spite of its improvements, which in turn results in it retaining an unimpressive neutral game. By extension, Lucario's faster falling speed and higher gravity result in it becoming more vulnerable to combos. Extreme Speed covers only an average amount of distance with minimum to low Aura, while Aura Sphere is only useful for KOing when Lucario has at least average Aura. Overall, Lucario has achieved respectable results in spite of its relatively small playerbase. Lucario's design has changed. Its forepaws, pupils, spikes, and the concha of its ears are slightly smaller. Additionally, the hook-shaped tip of its tail is significantly more pronounced, and the fur around its neck is no longer ruffled upward. 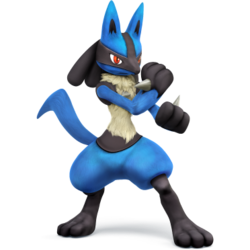 Lastly, the aesthetic used in SSB4 has resulted in Lucario having a sleeker design, and the blue portion of its fur being more vibrant. Altogether, these changes make Lucario appear virtually identical to its appearance in Pokédex 3D Pro. Lucario is slightly more expressive. Up taunt's visual effects have changed. Lucario now surrounds itself with a jagged, flame-shaped field of Aura, instead of emitting tiny wisps of Aura from its body. Side taunt's visual effects have slightly changed. Lucario now emits a slightly larger blast of Aura. Unlike the previous game, Lucario's tail lacks physics-based movement. Aura has updated multipliers (0.7× → 0.66× (lowest), 1.4× → 1.7× (highest)) and percentage windows (0%-20% (minimum Aura)/21%-74% (low Aura) → 0%-69% (minimum to low Aura), 75%-169% → 70%-189% (average to high Aura), 170%+ → 190%+ (maximum Aura)). These changes improve Lucario's combo potential with minimum to low Aura, and improve its KO potential with average to maximum Aura. However, they hinder its KO potential with minimum to low Aura, and hinder its combo potential with average to maximum Aura. Lucario's entire moveset is now affected by Aura. Lucario is lighter (100 → 99). Lucario walks faster (1.0 → 1.05). Lucario dashes faster (1.414 → 1.55). Lucario's air speed is faster (0.987 → 1.09). Air dodge has less startup (frame 4 → 2) and ending lag (frame 40 → 32). Air dodge has a shorter duration (frames 4-29 → 2-25). Lucario falls faster (1.2 → 1.68). This improves its vertical endurance, but makes it more susceptible to combos. Lucario's gravity is higher (0.0625 → 0.084). This improves its aerial mobility, but hinders its horizontal endurance. Rolls have a shorter duration (frames 4-19 → 4-14) and have more ending lag (frame 28 → 30). Sidestep has a shorter duration (frame 2-20 → 2-15) and has more ending lag (frame 26 → 27). The newly-added rage stacks with the effects of aura. Neutral attack's first and last hits deal less damage (3% → 2.5% (hit 1), 5% → 3% (hit 3)). Forward tilt's first hit deals 1% less damage (5% → 4%). This makes it connect together better with its second hit. Forward tilt's second hit now deals consistent damage (6% (body)/8% (arm) → 6%). Up tilt no longer deals consistent damage (6% → 6% (foot)/5% (leg)), although its knockback was compensated (33/38/43 (base)/130 (growth) → 45/45/50 (base)/110 (growth)). These changes significantly improve its combo potential with minimum to low Aura at low to medium percentages, and its juggling potential with average to high Aura at high percentages. Down tilt deals 2% less damage (7% → 5%), improving its combo potential with minimum to low Aura at low percentages. Lucario has a new dash attack, a flying kick. Compared to the previous dash attack, it deals less damage (10% (clean)/7% (late) → 8%/6%), and has a shorter duration (11 frames → 9) and more ending lag (frame 35 → 42). Dash attack has more knockback growth (50 → 75) and better range compared to the previous dash attack, making it stronger in spite of its lower damage output. Unlike the previous dash attack, it is affected by Aura. All smash attacks have increased start-up (frame 21 → 22 (forward), frame 12/17 → 15/19 (up), frame 17 → 19 (down)) and ending lag (frame 43 → 55 (forward), frame 56 → 64 (up), frame 48 → 55 (down)). All smash attacks have slightly increased ranges. Forward smash deals more knockback (25 (base), 93 (scaling) → 40/106). Sourspotted forward smash deals less damage (14% → 13%). Forward smash also has a significantly shorter duration (frames 21-30 → 22-25), and can no longer hit opponents behind Lucario. Clean up smash no longer deals consistent damage (13% → 14%/12%). Up smash has received an additional hitbox that deals 4% and launches grounded opponents at 100°, slightly improving its horizontal range. The main hit also deals more knockback (32 (base), 95 (scaling) (clean), 28/100 (late) → 32/103). Down smash deals more knockback (25 (base), 93 (scaling) → 30/99). All smash attacks' animations have slightly changed. Lucario now stays in place and/or continuously trembles like the rest of the cast, instead of making a full movement. Neutral aerial deals less damage (11% (clean)/7% (late) → 8%/6%). This improves its combo potential with minimum to low Aura at low percentages, but hinders its spacing potential. Neutral aerial has increased start-up lag with a shorter duration (frames 6-24 → 8-11, 22-29), and has decreased range. Neutral aerial has decreased ending lag (frame 69 → 43). Forward aerial deals 1% more damage (5% → 6%), and deals much higher knockback (28 (base, 100 (scaling) → 80/70). It also has an altered angle (50° → 64°). Altogether, these changes improve its combo potential with low Aura at low percentages, but hinder its KO potential. These changes also hinder its combo potential at higher percentages with low aura and at lower percentages with high aura. Back aerial deals more damage (12% (clean)/9% (late) → 15%) and has increased base knockback (12 (clean)/7(late) → 30), significantly improving its KO potential. Back aerial has increased start-up lag with a shorter duration (frames 15-28 → 16-19). It also auto-cancels later (frame 33 → 40). Up aerial no longer deals consistent damage (10% → 11% (clean)/6% (late)). Up aerial has increased base knockback (15 → 30). Up aerial has a shorter duration (frames 10-21 → 10-11 (clean), 12-15 (late)) and it auto-cancels later (frame 27 → 29). Down aerial deals less damage (8% (both) → 5% (hit 1)/6% (hit 2)) and has increased ending lag (frame 29 → 31). Down aerial's stall effect is also weaker hindering its stalling potential. It can also no longer auto-cancel in a short or be performed twice in a short hop. All grabs have increased ranges. Grab has decreased ending lag (frame 30 → 29). Dash and pivot grabs have more ending lag (frame 30 → 36 (dash), frame 31 → 34 (pivot)). All grabs also have a shorter duration (3 frames → 2). The changes to Aura significantly improve Pummel's damage racking potential. Forward throw deals 2% less damage (10% → 8%) and has decreased knockback growth (65 → 55), hindering its spacing potential. Back throw has decreased knockback (65 (growth)/60 (base) → 60/50). Up throw deals 5% more damage (6% → 11%), has increased base knockback (60 → 70), and its angle has been altered (90° → 88°) improving its KO potential. The changes to Aura and hitstun canceling, allow it to maintain its combo potential with minimum to low Aura at low to medium percentages despite these changes. However, these changes hinder its overall combo potential especially with high Aura and the removal of chain grabbing hinders its damage racking potential. Down throw deals 3% less damage (10% → 7%), and its knockback growth was not fully compensated (25 → 30). Down throw's angle has been altered (75° → 80°). When coupled with its lower knockback, the changes to Aura and hitstun canceling, these changes improve its combo potential with minimum Aura at low to medium percentages. Edge attack now deals consistent damage compared to his old fast edge attack (8% (Aura)/6% (body) → 7%). Non-fully charged Aura Sphere deals less damage (13.125% (minimum Aura)/≈18.75% (low to high Aura) → 11.385%/17.25%), hindering their KO potentials. Fully charged Aura Sphere with maximum Aura deals 3.075% more damage (26.25% → 29.325%), significantly improving its KO potential. Aura Sphere and Force Palm's sizes now scale with Aura. Reverse Aura Sphere now slightly pushes Lucario backward, improving its mindgame potential. Aura Sphere has updated visual effects. Its outline is thicker and makes it appear slightly jagged, instead of smooth. Force Palm's near blast deals 1.88% more damage (10% → 11.88%). Force Palm's mid and far blast deal less damage (9% (mid)/8% (far) → 7.56% (both)). Force Palm's blast is faster, larger, and has increased knockback. Minimum Aura Force Palm's grab can now be escaped from. Force Palm's animation has changed. Lucario now leans in further with its body facing more at a more sideways angle, places its following arm high and behind itself, and performs a stomp with its leading foot while firing the blast. Force Palm's visual and sound effects have changed. Its blast is now shaped like a smooth flame instead of a jagged flame, and its sound effect's pitch scales with Aura. Extreme Speed has received a hitbox at the end of its animation that deals 3% and launches at 38°, improving its safety. The distance it covers also now scales with Aura, drastically improving its recovery. Extreme Speed has increased ending lag. However, this can be avoided by ending it on the ground, or by making Lucario hit the stage head first. Extreme Speed has updated visual effects. Lucario now emits streams of Aura from its forepaws. Double Team has increased power and range. Lucario has a new Final Smash, Mega Lucario. Lucario undergoes Mega Evolution to become Mega Lucario. Unlike Aura Storm, Mega Lucario is a transformation-based Final Smash that can move freely across the stage. Mega Lucario has an Aura multiplier of 1.8×, regardless of Lucario's damage prior to Mega Evolving, and has both super armor and flinch resistance throughout its duration. However, its duration will shorten upon receiving damage. Lucario has received a mix of buffs and nerfs from game updates. While it has experienced few direct changes, its most notable nerf in 1.0.4 gave a significant increase to Extreme Speed's landing lag if Lucario lands while helpless, making it notoriously exploitable. However, update 1.1.3 improved Lucario's mobility by increasing its walking, air and falling speeds, the latter of which makes it slightly less susceptible to vertical KOs. The changes to shield mechanics have affected Lucario indirectly: due to the shieldstun increase brought about by update 1.1.1, Lucario could attempt to break shields by using Aura Sphere on the edge with the opponent shielding so the opponent could fall for an unavoidable KO if they did not attempt to SDI out of the move. However, this technique was very situational and was not used at high-level play. Furthermore, Aura Sphere became even more situational as of update 1.1.3, thanks to its decreased hitlag resulting in it being impossible to perform with a charging Aura Sphere charge at low Aura. Despite this, it is still possible to perform with a charging Aura Sphere at high Aura, as the higher damage output generates more shieldstun and hitlag. Even so, Lucario's most damaging moves, such as its smash attacks and Force Palm, benefited from these changes thanks to their ranges and, in the case of its forward and down smashes, their hitlag. Forward smash's ending lag increased: frame 46 → 55. Down smash's ending lag increased: frame 50 → 55. Landing lag from helplessness increased: 36 → 60 frames. Fixed a glitch where Extreme Speed could be used to cancel hitstun. Fixed Extreme Speed's landing lag glitch. Neutral attack's first and second hits' knockback decreased. This allows them to connect together better. Glancing Counter's angle altered: 58° → 65°. Glancing Counter's ending lag decreased. Falling speed has been increased. Air speed, fast falling speed and walking speed have been increased. Aura Sphere charge (including custom variants) angle: 80° → 83°. Aura Sphere (including custom variants) knockback growth: 100 → 93. Aura Sphere charge (including custom variants) hitlag modifier: 1x → 0.78x, making it less safe on shield. Aura Sphere (including custom variants) base knockback: 10 → 12. Aura Sphere (including custom variants) hitlag modifier: 1x → 0.78x, making it less safe on shield. Lucario's moveset is affected by Aura. The following moveset list details the properties of its attacks when its Aura is at its lowest (0%), average (70%), and highest levels (190%). Lucario is able to crawl, wall cling, and wall jump. 2.5% The kham choui, a downward sweeping punch in Shaolin Kung Fu, followed by the choong choui, a jab-style punch in Shaolin Kung Fu, followed by a stretch kick. 4% (hit 1), 6% (hit 2) The kap theai choui, a low-angle cross-style punch in Shaolin Kung Fu. Hits twice even though Lucario only uses one paw. 6% (foot), 5% (leg) An outside crescent kick. Can reliably combo into itself when Lucario has low Aura, and is a reliable juggling option with average Aura. 5% A kneeling Hapkido-style shin kick. It can be followed up with a dash attack or a dash grab with low Aura. 8% (clean), 6% (late) A flying kick. A decent follow-up from a down tilt with low Aura, or a back throw with average Aura. 16% (clean), 13% (late) A double palm thrust that emits small blasts of Aura. When Lucario is at full power and has high Aura, it is the strongest and the most damaging forward smash in the game, dealing 38% when fully charged and sweetspotted. It is a one-hit KO with max Aura and performed near the edge or center-stage. 4% (hit 1), 14% (clean sweetspot hit 2), 12% (clean sourspot hit 2), 9% (late hit 2) A modified version of the long choui, an uppercut-styled punch in Shaolin Kung Fu. Hits twice even though Lucario only uses one paw. When it is fully charged, sweetspotted, both of its hits connect, and Lucario has max Aura, it is one of the strongest up smashes in the game and the most damaging smash attack in the game, dealing 42%. 14% A modified version of the kap theai choui. Hits on both of its sides and is one of the strongest down smashes in the game when Lucario has max Aura. 8% (hit 1), 6% (hit 2) Spins while emitting Aura from its paws. Very low landing lag, great for spacing. Depending on aura, it can lead into a grab, dash attack, tilts, and even a tech situation. 6% A stretch kick. Can be used as a follow-up twice after its down throw beginning at 0% and up to low percentages. 15% The sou choui, a sweeping punch in Shaolin Kung Fu. It is the strongest back aerial in the game thanks to its high knockback and one of the strongest aerials in the game when Lucario has max Aura, KOing opponents under 50%. However, it has rather long start-up. 11% (clean), 6% (late) Leans back and performs a front kick upward. One of the strongest up aerials in the game, KOing opponents beginning at 70% when Lucario has max Aura. 5% (hit 1), 6% (hit 2) Stomps twice. Unlike in Brawl, it no longer stalls Lucario's descent. 1% A surge of Aura. The fastest pummel in the game and one of the best pummels in the game if Lucario has high or max Aura. 8% Shoves the opponent away. The strongest forward throw in the game when Lucario is at max Aura, on par with Bowser's. It is also the fastest throw in the game. 10% The tai otoshi, a Judo throw. The most damaging back throw in the game and a viable KOing option when Lucario has max Aura. 5% (hit 1), 6% (throw) The pao choui, an uppercut-styled punch in Shaolin Kung Fu. Launches the opponent upward and with low Aura, it can act as a set-up for its up tilt, neutral aerial and up aerial. Other opponents next to Lucario are dealt high knockback. The most damaging throw in the game when Lucario has max Aura, dealing 18% total. 7% Holds the opponent over its head and then slams them into the ground. Can lead into its neutral, up or forward aerials with low Aura and while opponents are at low to medium percentages, although lightweights can avoid these combos. 7% Kicks around itself before getting up. 5% Kicks behind itself and then in front of itself while getting up. 7% Performs a double palm thrust that emits a small blast of Aura while climbing up. Default Aura Sphere 17.25% (fully charged) A chargeable, condensed sphere of Aura. Pressing the special button again will make Lucario fire the sphere. Its size scales with Aura. A charging Aura Sphere can lead into up smash for a KO. Custom 1 Snaring Aura Sphere 14.5% (fully charged) A slower variation that has a vacuum effect that pulls opponents toward the Aura Sphere itself. Has extra ending lag and deals slightly less damage. Two uncharged Snaring Aura Spheres can exist on-screen at the same time. Custom 2 Piercing Aura Sphere 6.75% (fully charged) A faster variation that pierces opponents, but deals significantly less damage. Default Force Palm 11.875% (near blast), 7.5% (mid/far blast), 13% (throw), 6% (escape) Fires a stream of Aura. Its blast's range scales with Aura. If the opponent is close to Lucario, the move acts like a grab, with Lucario grabbing the opponent and then striking them with a palm thrust at point-blank range. Custom 1 Advancing Force Palm 10% (near blast), 7% (mid/far blast), 10% (throw), 6% (escape) Moves Lucario forward, but deals slightly less damage and has more start-up lag. Custom 2 Long-Distance Force Palm 7.4% (near blast), ≈4.23% (mid/far blast), 13% (throw), 6% (escape) Has more range, but deals less damage. Default Extreme Speed 6% Propels itself in a predetermined direction by blasting steams of Aura from its forepaws. Has a hitbox at the end of its animation. Like Force Palm's blast, Extreme Speed's range scales with Aura. Custom 1 Ride the Wind — Slower and deals no damage, but grants more control over Lucario's trajectory. Custom 2 Extreme Speed Attack 4% (hit 1), 7% (hit 2) Has less range, but damages opponents at any point it makes contact with them. Default Double Team 11% Performs a kata. If Lucario is attacked, it will disappear while emitting afterimages and then counterattacks with a flying kick from behind the attacker. Custom 1 Glancing Counter 10% Dodges attacks and also allows Lucario to produce a hitbox, albeit a weaker one, even if it is not attacked. Custom 2 Stunning Double Team 1% (hits 1-2), 1% The counterattack stuns the opponent, similarly to Disable. Like Disable, the stun's duration is longer the more damaged the opponent is, but it also deals minuscule damage due to not being a true counterattack. Mega Lucario — Mega Evolves into Mega Lucario. Mega Lucario has an Aura multiplier of 1.8×, regardless of Lucario's damage prior to Mega Evolving, and has both super armor and flinch resistance throughout its duration. However, its duration will shorten upon receiving damage. Lucario can still use his custom special moves after transforming. Hovers slightly above the stage, and then spreads its arms and legs slightly while briefly emitting a surging, jagged, flame-shaped field of Aura around itself before descending. Up taunt: Folds its arms and then extends them while growling and emitting a surging, jagged, flame-shaped field of Aura around itself. Side taunt: Extends its right forepaw forward and growls before emitting a small blast of Aura from its forepaw. Down taunt: Performs a kata that is very similar to the one performed during Double Team. Stretches both arms out, one on each side, slowly lowers its body, and assumes its normal stance again. Moves its arms in a circular motion before assuming to its normal stance again. Moves its paws in front of itself and then clasps them together while saying "The Aura is with me!" (波導は我にあり！, The aura is with me!). Extends both arms forward and next to each other while emitting small blasts of Aura from its paws, then assumes a Fujian White Crane-like stance while saying "Behold the power of Aura." (満ちるぞ,この波導！, I am filled with aura!). Performs a kata where it leans forward while extending its left arm forward, keeping its right arm to its side, and performing a kiai while a flame-like field of Aura briefly surges from its body. Astro - Has a win over Holy. Placed 5th at Enthusiast Gaming Live. Blacktwins - The best Lucario player in Canada. Notably double eliminates Samsora with Lucario at Friday Night Smash Delight : A Mini Showdown 3 and has taken two sets over Mistake. Day - Considered the best Lucario player in North America. Took a set off ZeRo at Super Smash Con 2016. Placed 17th at said tournament. Formerly ranked 38th on the Panda Global Rankings v2. Gomamugitya - One of the best Lucario players in Japan. Frequently teams with Taiheita, creating a powerful doubles team (with them notably winning Super Smash Con 2016 over ZeRo and Nairo). Jeda - Considered the best Lucario player in Europe. Ranked 9th on the French Power Rankings. Has sets over players like Meru, Ogey, TheFlow and Glutonny. JohnnstR - One of the best Lucario players in the Midwest. Expanded Lucario's metagame and has achieved high results against Michigan's top players. Kamicario - One of the best Lucario players in North America. Notably placed 13th at CEO 2015 and 5th at Low Tier City 3. Loota - One of the best Lucario players in Europe. Notably placed 3rd at Eclipse. Maverick - Considered the best Lucario player in the New England region. Notably placed 5th at GUMS 8 and 17th at Shine 2016 and has defeated Marss and Ned. Motsunabe - One of the best Lucario players in Japan. Okoru - One of the best Lucario players in the Midwest. Has a win over Zinoto. P2P with Gibus - Considered the best Lucario player in Texas. Notably placed 7th at Low Tier City 4. Pitbull - Placed 17th at 2GGT: ESAM Saga and 33rd at SwitchFest. He has taken games off of players such as Dath and NCJacobT. QD - One of the best Lucario players in the Midwest. Placed 25th at The Big House 8. Expanded Lucario's metagame. Richi - Has sets over players like Serge. Placed 25th at Smash Factor 7. Serge - Considered the best Lucario player in Mexico. Ranked 4th on the Mexican Power Rankings. Shiny - Ranked 3rd on the Eastern Washington Power Rankings. Tsu- - Considered the best Lucario player in the world. Placed 2nd at Frostbite 2017, 7th at 2GGC: ARMS Saga, 13th at EVO Japan 2018 and 2GGC: MkLeo Saga, and 25th at EVO 2017. He has taken sets off of players such as ZeRo, Abadango, Mr.R, VoiD, Salem, Tweek, KEN, and Kirihara. Currently ranked 46th on the Panda Global Rankings v5. Vivid - Also known as "justy", uses Lucario as a secondary and is considered the best Lucario in Tri-State. Ranked 3rd on the New Jersey Power Rankings. XF0 - Considered the best Lucario player in the Middle East. Took a set off of Mr. R at Nemesis 2017. Lucario was considered to be a viable character since the game's release. The aura buffs, which vastly increased Lucario's KO power to the point where a max Aura Lucario could consistently KO opponents under 75%, and improved its recovery to become one of the best, as well as a powerful combo game, lead many professionals to view Lucario as a high-tier character. Despite its low tournament representation, it achieved lukewarm results in the game's early lifespan thanks to notable players such as Day, Motsunabe and Serge, and would eventually be ranked 23rd on the first 4BR tier list. More recently, Lucario has achieved better tournament representation in competitive play. At Smash Factor 5, Serge, along with fellow smashers Daimy and Richi, placed among the top 12 using Lucario. Day also managed to place 17th at Super Smash Con 2016, a much bigger tournament which had many top level players attending and notably saw him defeat ZeRo, which sent him into the losers bracket of said tournament, a feat achieved by only a select few. Gomamugitya also managed to place 1st with his partner in the doubles tournament of Super Smash Con 2016 while using Lucario. This caused it to slightly rise to 22nd place on the second tier list. However, Lucario's tier position was considered one of the most contentious of all characters, as some within the community (that grew steadily bigger around late 2015) began seeing Lucario as having one of the worst neutral games due to its laggy attacks and subpar movement speed, and viewed its recovery as blown out of proportion as its flaws were surprisingly easy to exploit, especially with its extreme landing from a helpless state lag post 1.0.4. they considered Lucario as a poor character who suffered from overspecializing with the aura gimmick, thus leaving it as little threat to a cautious player. As time went on, Lucario's tournament results grew barren, with fewer players maining it, thus causing more and more to look down on it. However, Lucario's results then noticeably improved as time went on due to some new developments in its metagame, and has seen generally improved results, especially in Japan, leading it to be perceived more positively again in spite of very skilled competition. This allowed Lucario to rise to 19th on the third and tier list. While some felt that Lucario's placement was too high due to its inconsistent results and "high-risk, high-reward" playstyle, Tsu- surprisingly placed 2nd at Frostbite 2017, while sending ZeRo to the losers bracket and having very close games with him on the tournament's grand finals, making these thoughts less common. This very high result, tied with more consistent ones, have led Lucario to rise to 17th on the fourth and current tier list. As such, the majority of players feel that Lucario's current placing is well deserved for the time being, so it is still seen as a viable pick in tournaments. This Fighting- and Steel-type Pokémon can sense the movements of its enemies using its Aura abilities, and is even said to be able to see enemies when they're invisible. As it takes damage, its attacks grow in strength. At maximum power, its deals triple damage, which can make its Aura Sphere attack a real force to be reckoned with! Lucario's up special Extreme Speed will send this Pokémon soaring on the path you choose. Lucario flies farther the more damage it's taken. Lucario makes use of its Aura for the side special Force Palm. At extremely close range, Lucario will grab an enemy first, dealing additional damage. The Extreme Speed up special sends Lucario rushing in your chosen direction, and you can adjust the flight path mid-air. Also, the more damage Lucario takes, the further it will go. For the Force Palm side special, Lucario attacks with its Aura. Using it while close to an enemy adds a grab to the move and deals extra damage. In Lucario's Final Smash, it Mega Evolves into Mega Lucario. The attacks it can use don't change, but its Aura abilities become more powerful than ever, letting it deal more damage and launch opponents farther. It can also resist being launched by other fighters, but the more attacks it takes, the sooner it will transform back. For Lucario's Final Smash, it Mega Evolves into Mega Lucario. The attacks it can use don't change, but its Aura abilities become more powerful than ever, letting it deal even more damage and launch opponents even further. It can also resist being launched by other fighters, but the more attacks it takes, the less time the Final Smash lasts. All-Star Battle: Brawl: Lucario is one of the opponents fought in this event. All of the opponents debuted in Brawl. Aura Mastery: A highly damaged Lucario must defeat an invisible Sheik and an invisible Wii Fit Trainer. Fire-Type Frenzy: As Charizard, the player must defeat Lucario, Greninja, and Pikachu all appearing after another. Pokémon Battle: As Greninja, the player must defeat a team of Lucario, Pikachu, and Charizard. Pokémon Multi Battle! : Pikachu and Charizard must defeat a team of Lucario and Greninja, then a team of Pikachu and Charizard each appearing after one opponent is defeated. Lucario can appear if Pikachu is KO'd. The Ultimate Battle: Two players select characters and must defeat the entire roster. Lucario in the Nintendo Direct from April 8th, 2014. Using Mega Lucario, its new Final Smash. Using its down smash on Mario and Link. Air dodging while Mario and Mega Man attack the Yellow Devil. Using its neutral attack's last hit alongside Wii Fit Trainer's forward tilt. Using Double Team against Link. Teetering while King Dedede charges Jet Hammer. Sleeping under a tree grown by Villager. Using Extreme Speed on Rainbow Road. Using Extreme Speed alongside Luigi's Super Jump Punch. Using its up taunt in Super Smash Bros. for Nintendo 3DS. A picture displaying Aura Sphere's size difference in scale with Lucario's Aura. Using Double Team against Marth's Shield Breaker. Using its back aerial alongside Samus and Diddy Kong's back aerials. Taunting alongside Charizard, Greninja and Pikachu. The Lucario error on the Super Smash Bros. official Facebook page. 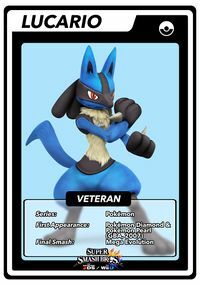 On the Super Smash Bros. official Facebook page, Lucario was first listed as originating from Pokémon Diamond and Pearl Versions on the Game Boy Advance, even though those games were actually released on the Nintendo DS. This was later fixed. Lucario and Dr. Mario are the only characters to lack a meteor smash of any kind, including unconventional meteor smashes. Lucario and Mewtwo are the only Pokémon whose on-screen appearances do not involve emerging from a Poké Ball. This marks the only time Lucario is a starter character in the Smash franchise. Lucario is the only character whose up special move is still affected by the grab release glitch. While Bowser, Little Mac, and Wario use mirrored versions of their regular special moves as opposed to their custom versions after transforming via their Final Smash, Lucario is still able to use his custom special moves, further enhanced by the boosted Aura. This page was last edited on March 25, 2019, at 18:22.